Here you can subscribe on our Youtube channel. Today, we’d like to share how our vlogging journey started. One day, we were all having lunch together and somebody brought up our plan going forward. It was during that same discussion when we came up with the idea to start our very own YouTube channel. We want entrepreneurs and new startups to receive this valuable information in the shortest amount of time possible. Many people value their time, especially entrepreneurs; so creating short, informative will save our viewers some time and provide them with useful content. 1) Video marketing is a very powerful tool that can generate traffic for your website and other social media channels, increasing brand awareness. 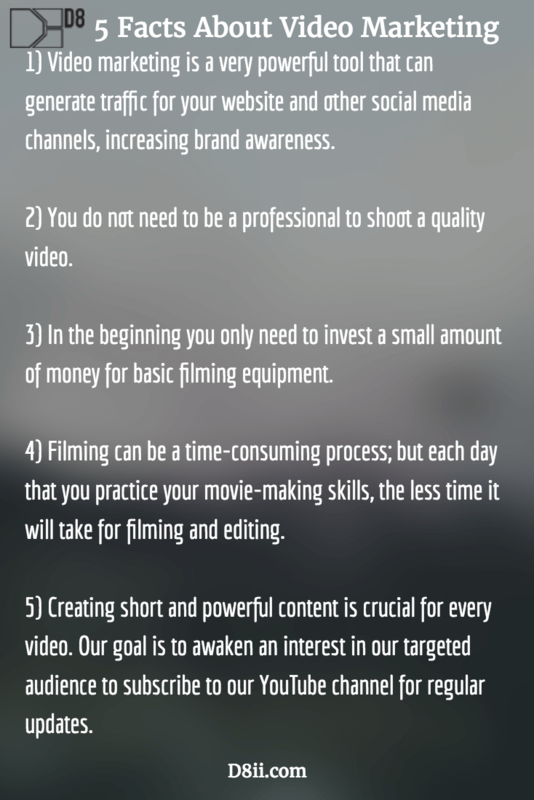 2) You do not need to be a professional to shoot a quality video. 3) In the beginning you only need to invest a small amount of money for basic filming equipment (camera, microphone, memory card, editing software, etc.). 4) Filming can be a time-consuming process; but each day that you practice your movie-making skills, the less time it will take for filming and editing. 5) Creating short and powerful content is crucial for every video. Our goal is to awaken an interest in our targeted audience to subscribe to our YouTube channel for regular updates. As an introduction to our YouTube vlog we decided to shoot several videos about D8ii Limited. We are just now starting our vlog journey, but we truly believe it will be successful and a useful source for entrepreneurs! Again, don’t forget to subscribe to our YouTube channel! Our first 100 subscribers will receive a special reward!